Calpino is adjoined to the larger town of Fermignano in the Marche area of Italy. Nearby is the picturesque city of Urbino with it's ancient buildings and monastery commanding an elevated position over the surrounding villages. Calpino is a relatively new parish which serves the local small industries - mainly concerned with the manufacture of furniture. 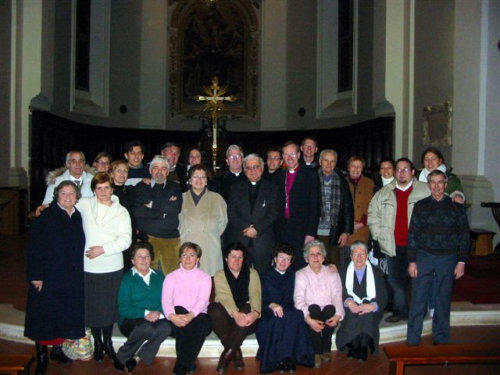 In September 2002 a link was established between our two parishes as a result of an initiative between St. Albans and the Diocese of Urbino in Italy. Canon Ian Arthur and his wife Heather visited Calpino where they met Don Peppino and the members of his Church . For four days they were given a royal welcome, shown around the district and involved in ecumenical discussion and worship. This included a meeting with the Archbishop of Urbino where greetings from Bishop Christopher were conveyed. As a result of a return invitation, a brief visit to Sharnbrook by three young men from Calpino followed at the end of December 2002 and arrangements made for a larger group to follow in May 2003. We are all most grateful for Ian and Heather who had made meticulous plans and preparations for this visit. 2. Visit to Sharnbrook 1st.- 5th. May 2003. In the early hours of Ist. May fourteen weary travellers arrived in Sharnbrook and were settled with their hosts who would give them hospitality for the weekend. Later that day we travelled with our visitors to St. Albans for a guided tour of the Abbey and a meeting with Bishop Christopher (Hertford) who had visited the Urbino Diocese. Back in Sharnbrook we had a meeting with representatives of the Sharnbrook Churches Together. The next day we set off for London by coach for a guided tour by Ian and a chance for our friends to spend some time around St. Pauls Cathedral and the Westmister area. Saturday gave our visitors space for a few local visits and then in the evening we all enjoyed a barbeque in the grounds of Sharnbrook House sharing in each other's conversation and singing. Sunday was the climax of the weekend with two very moving acts of worship. At our dual language Sung Eucharist in the morning , Don Peppino gave a short address through an interpreter which underlined the importance of our common Christian bonds and future opportunity to grow further together. Don Peppino and all our visitors received a blessing from Canon Ian Arthur . 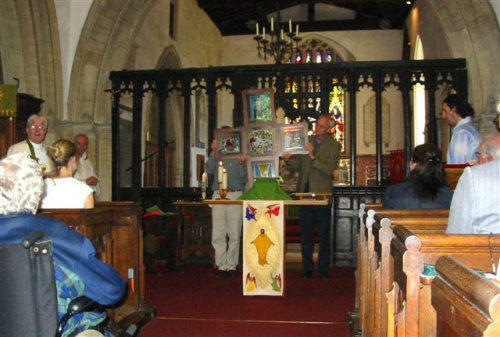 As a gift to the people of Calpino we presented a plate depicting Sharnbrook Church which had been made by a local village potter. As a symbol of our unity, the people of Calpino have made a beautiful wooden cross for us. It is inset with glass panes painted with the Easter story by their young people. Unfortunately, this was too big to bring with them and so they presented us with a framed picture of it until it can be collected or delivered. Following an excellent Parish Lunch in the village hall, Don Peppino celebrated Mass in St. Peters at 5.0 p.m which was well attended by our local Catholic friends and some Italians in the area. On Monday morning we said our fond farewells to our guests feeling that in just a few days we had made true and lasting relationships with a wonderful group of people and that our Church family had been spiritually uplifted by the whole experience. Ian Arthur, Colin Scott, Anne Osborn, Barbara Woplin and Jane Roberts left Stanstead for Ancona where we were met and transported to our hosts in the parish of Calpino. After a warm welcome dinner that night we were taken on Friday 23rd. for a tour of the magnificent Dukes Palace in Urbino and the recently refurbished Cathedral. We had by then been joined by the Bishop of Bedford – Richard Inwood, his wife and two other clergy from England. In the evening we took part in the first of the three ecumenical services in Pesaro, where we met up with a priest and lay people from Denmark, and representatives of the Rumanian Orthodox. The service was based on the message of peace and we were all allocated a reading or prayer to lead. Short testimonies by the leading Church representatives were also given. This general form was to be used for all three diocesan events. The Cathedral was full and with the simple music we found it very moving and felt privileged to be amongst our fellow Christians – particularly at the sharing of ‘The Peace’ when we all greeted each other warmly. On Saturday 24th. we travelled to Fano where we had a very meaningful ‘round table’ with the local area representatives being also joined by a Greek Orthodox Priest. Following a short tour of Fano it was time for the second service in the series again in a full cathedral and led by the Bishop of Fano. Again - a very enriching experience. On Sunday, following a short Anglican Communion service at 10.00 am in Calpino, we joined the local parish of ‘Christ the Worker’ at their main morning Mass. We took part by introducing ourselves and leading an English worship song that we had rehearsed with Ubaldo and their choir. 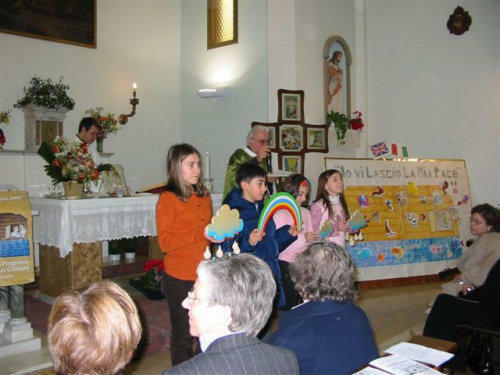 We each received a blessing and at the end of the service there was an exchange of gifts where we all received beautifully made wooden rainbows which had been used in the ecumenical services as a symbol of God’s enduring love between heaven and earth. Following lunch at ‘Castelcavallino’- a village high up near Urbino and the site of a Diocesan meeting centre, we moved on to Urbino for the final ecumenical service. Although a fall of snow had reduced the congregation slightly it was another very moving act of worship and followed by a chance to say goodbye to our Danish and Orthodox friends. Before we left Ancona on the Monday 29th. we were greeted by the deputy mayor of Calpino and Fermignano at a short reception where links with youth work and future initiatives were discussed. We then paid a warm farewell to our friends in Calpino following an important and very memorable few days with our fellow Christians. Fifteen members of St. Peter's visited our link Parish of 'Christ The Worker' Calpino for more of an informal visit. We were again shown wonderful warmth and hospitality by our hosts. We enjoyed visits to Urbino, Florence, Fano and nearby Fermignano. We were entertained at a barbeque on Sunday evening following our joint services earlier in the day. The following pictures portray the highlights of our visit. We were all delighted that Ubaldo Ragnoni from Calpino was able to attend Ian's final service and celebration lunch. He brought best wishes from Don Peppino and all our friends there. What made it more special was that the beautiful cross which they had made for us last year, also arrived just two days before and Ubaldo was able to present it as a surprise for Ian at the service. The pictures show the presentation and by Ubaldo and the cross installed in St. Peter's Sanctuary. Early in 2005 Bishop Christopher Herbert of St. Alban’s suggested that he lead a Pilgrimage to Assisi so that all the parishes in the diocese with Italian links could participate in a joint venture. The date of 13-17th. 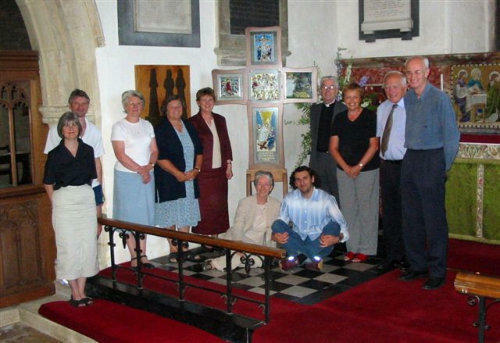 June 2006 was fixed and following preliminary planning and awareness sessions, a total of 45 people in the diocese (9 from St. Peter’s Sharnbrook ) signed up to go. As with the other respective parishes, we wanted to combine this with a visit to our link parish of Calpino and arranged to arrive there on Thursday 8th. June and stay until Monday 13th. when we would join the other Anglicans and the Bishop in Assisi. This was also the first time Robert and Caroline Evens had visited Calpino Calpino: As usual we were given wonderful hospitality over the weekend 8th- 12th. June and were treated to memorable visits to Gradara - near Pesaro and San Leone near San Marino. These were two hill hamlets with fortresses giving us wonderful views of the surrounding countryside. We were able to take our normal active part in the main Sunday morning celebration following our own Anglican Eucharist and visited the sisters of the St. Clare Monastry in Urbino in the afternoon. Great fellowship and singing was enjoyed on Sunday evening following the barbeque and we said goodbye to many of our old friends before departing for Assisi on Monday. Assisi: Joining the Bishop of St. Albans and our friends from the other link parishes we were taken by coach to Assisi on Monday afternoon to stay at the Domus Pacis Hotel. Having received briefings from Rev. Jules Bergquist she guided us around Assisi on the Tuesday visiting Santa Maria degli Angeli and the Porzioncola where St. Francis started his order and then up to the Piazza del Commun. We had a Eucharist service at the small Church of St. Stefano and visited the Church of 'St. James on the broken wall'. Wednesday we had two local guides to lead us around the amazing Basilica of St. Francis and then the lower part of the city including the Basilica of St. Clare and the Monastry of San Damiano where St. Clare founded her order of 'The poor Clares' and spent forty years of her life. Thursday was a free day and the Sharnbrook contingent went off to Perugia - the main Umbrian centre and saw some of the features including the Cathedral, The National Umbrian Art gallery and the Fontana Maggiore. The main event Friday started with the meeting up with some of our Italian hosts at 5.00 p.m. for a pre-dinner reception with the Archbishop of Pesaro and Bishop Christopher. After dinner together we were transported to the Basilica where we celebrated a joint act of worship in the tomb of St. Francis. This was a special occasion given the setting and many contributed to the intercessions to give thanks and pray for unity and peace. Following the service we had a further exceptional treat by being taken to the side gallery of the Basilica where we had magnificent views of Assisi at night. Saturday we started our walking pilgrimage of the city with a service by the cross of St. Damiano in the St. Clare Basilica. We had further short acts of worship at the Piazza Santa Maria Maggiore, St. Stefano and the Church of 'St. James on the broken wall' where we each deposited the name on paper of a personal ‘encumbrance’ to our faith and ‘discarded’ it by placing it in front of the altar. After a final lunch at the hotel we had our final act of worship in the modern chapel behind Santa Maria degli Angeli where Bishop Christopher expressed the thanks of us all for the wonderful experiences and organization of the week by Rev. Jules, Rev. John Williams, Alex Sharp and our Italian hosts. Following fond farewells to all our friends we joined the coach to take us with Bishop Christopher to Forli for our 10. 30 p.m. flight home.